Podcast: I’ll ring that up for you! O podcast de hoje fala sobre a expressão ring up. Last week I took a little vacation and spent a week in New York City. This was my first time back in New York City after ten years. And, of course I thought of Inglês Online and Inglês Online readers while I was there and… There are gonna be some pretty nice surprises for readers in the next few months. So sit tight, stick around and enjoy the blog in the meantime. Today I wanna talk about an expression I heard a lot while I was shopping. Guess what it has to do with? It has to do with paying for something at the cash register of a store. I heard it on my first day in New York, when I went to an electronics store to buy an mp3 player. So the store clerk pointed me to the player I wanted and when I said “I’ll take it”, she said “OK. I’ll get you rung up”. Again, she said “I’ll get you rung up”. So just to recap, here’s a little grammar for you: the word “rung” I just used… that’s the past participle of “ring”, r-i-n-g. So, it’s ring, then the past form is rang, r-a-n-g, and the participle is rung, r-u-n-g. So the participle is what I’m using… is what the store clerk used when she said “I’ll get you rung up”. Again: the way she said it, “I’ll get you rung up”, can’t really be translated in a literal way into Portuguese, so I’ll give you a few alternatives that mean the same thing. The store clerk could have said “OK, I’ll ring you up now” or “I’ll ring that up for you”. “that” is the mp3 player, right? “I’ll ring that up for you”. So, what does that mean… “I’ll ring you up” or “I’ll ring that up for you”? 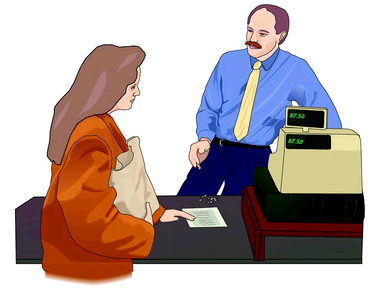 That usually means you and the store clerk will walk over to the cash register, and then the clerk will record the sale, and let you know what the total is, and then you give them the money, or your credit card… And after charging you, the clerk will give you a receipt, which is your proof of purchase. So that’s what “I’ll ring you up” or “I’ll ring that up for you” means. So you go into a store, and after you’re done selecting the items you wanna buy, you may walk over to a cash register so that a clerk can ring you up. Or maybe the store guy has just helped you find what you were looking for, and he says “I’ll ring you up when you’re ready”. That means he knows that you may want to look at other stuff to buy but, when you’re done, you can just let him know you’re done and he will ring you up. Like I said before, the clerk may also say “I’ll ring that up for you”. Let’s say the store guy sees you hanging around the store with three mp3 players in your hands. He may ask you “Is that all?” and if you say yes, he may say “I’ll ring those up for you”. By ‘those’, he means ‘those three mp3 players’. The first time I heard the expression “ring you up” or “ring something up” was on ESL Podcast. Here’s the web address: eslpod.com. Go over to their website and type the word “ring” into the search box and you’ll see a list of all podcasts that include this word. I think there are at least four podcasts with the expression “ring something up”. So next time you’re in a store or restaurant, and someone says I’ll ring that up for you… you know what they’re talking about. OK. Changing topics: I’d like to suggest a reading to you guys. It’s a post by Denilso de Lima, and it’s called Preocupações com a Pronúncia em Inglês. Just go there and read it. Of course we all want to speak well and be understood, right? For example, if you think the past form of ‘bring’ is ‘bróguiti’, you’d better go to thefreedictionary.com or some other place where you can hear the right pronunciation. And then just go do a lot of listening to help you internalize that and other words, because that kind of mispronunciation can harm your communication. But sometimes people can get caught up in stuff that, in my experience, really doesn’t make any difference practically speaking, such as how to pronounce ‘man’, singular, versus ‘men’, plural. So just go over to Denilso’s blog and read that post and see what you think. Alright, that’s all for today. Talk to you next time! Estava ouvindo hoje no celular e reparei este erro. O audio ainda está trocado, mas o link para baixar o mp3 está correto. Edson – já está disponível! Veja lá no menu superior. Pessoal, não tem como disponibilizar os Podcasts via feed/iTunes? @julio – you may be right! I has liked this site. It helped me very on my english study. So, after read the posts and heard the podcasts, I feel me able on the listening and reading. I am planning to go to the canada in the end of year. Hi Ana, I did enjoy your ring it up expression, just today talking to friends one of them asked how do you say, queda de braço, I said iron man arm game, is that correct? please at your earliest conveninece whenn it feasibel give a reply. tks. Hi Ana… I’m very fan your. That’s funny, cause you’re strange for me, but I’ve heard your podcasts and improved my English, this is it! My exemple: Five days ago I was buying two t-shirts in a store, but I bought a red one and the guy of the store rang me up in box a blue one… but I’ve just come home when I could see it. I guess there aren’t many errors. Where can i have text like these? Are there more text into this site? I did enjoyed that one, just outstanding. Ana, porque ele/a usou o verbo get e porque o verbo RING foi usado no pssado? Obrigado. @ Roberto – glad to know! Hi Magda, obrigada. O Jeff me inspirou bastante – realmente ele consegue explicar tudo de maneira simples. I’m sorry Ana, I haven’t read the note above about it being forbidden to post anything different of the lesson, so i’m sorry again. Eu gosto muito de escutar o Jeff, do ESL Podcast, pois ele e muito claro para explicar e para mim e um dos melhores podcasts com native speakers, porem gostaria de te dizer que voce tambem e a melhor que conheço aqui do Brasil. Parabens. Hello Ana, How are you doing? I’m going to New Zealand next year for a month to study English and to practice the several kind of sports it has, however I don’t know if it’s enough time to improve my English, so I would like to know what you think about it, I mean, I’ll spend so much money, because it’s so expensive and I’m afraid of that is not as viable as I hope. I’ll take English classes for two weeks and after that, I’ll travel to know everwhere. Take your time to answer me, ok? Have a great week. Ana, muito obrigado por este trabalho, vc tem me ajudado muito. Mto obrigado mesmo.